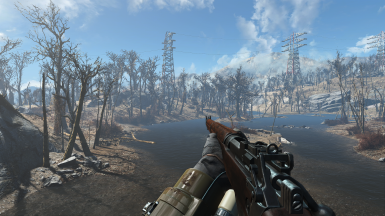 This mod adds an Lee Enfield No.4 Mk.1 alongside a small quest. 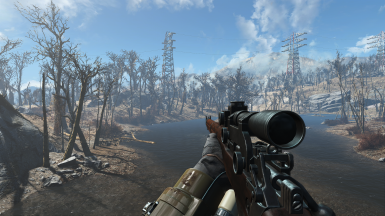 Lee Enfield by asXas - TRAD FR Vous devez impérativement installer le mod original en premier. Lisez la page d'accueil de ma traduction pour plus d'informations. Fixed Suppressor NPC detection bug. Added Zoom options for iron-sights. Fixed NPC/Followers not having any firing sounds.
! !THIS IS NOT THE ROYAL ARMS PACK!! Also, the Tape Hunt makes a return. You can build more Battery Ammo and .303 at the Chem bench. 1.5 - Added 200% more memes for all my Brazilian fans. VIS/AWKCR Patch by Laptoprocker﻿ available as an optional file. New Calibers .303 Patch by zachtan1234 available as an optional file.